Join us for a traditional Lucia concert at First Lutheran Church, located at 225 S. Third Street on December 6th at 7:00 PM. 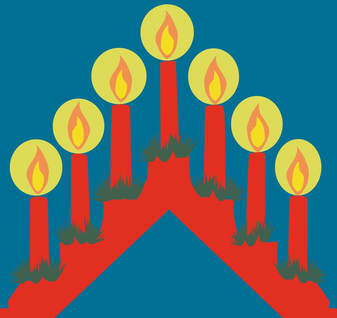 ​ This annual event brings the holiday spirit with traditional Swedish songs and candlelit processional. A goodwill donation will be taken for this event. Continue the holiday spirit with our annual Julmarknad! Join us at Our Savior's Lutheran Church, located at 3300 Rural St on December 7th from 9:00 AM- 1:00 PM. Families can join in the annual Breakfast with Tomten starting at 10:00 am. Lucia children will help serve breakfast and will perform at 10:30 am. Reservations are required for the Breakfast with Tomten. 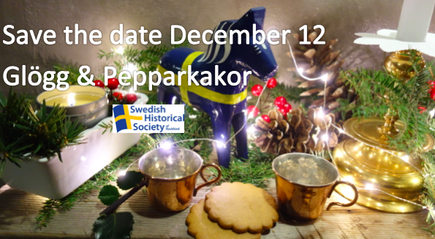 Sing Swedish songs, enjoy festive music and dance around the Christmas tree! Throughout the entire day you can shop the Marknad with vendors of all kinds! Swedish foods, bakery, handmade crafts and even a MorMor's Attic will be featured. Don't forget to stop by the Kaffe Stugan and enjoy treats and delicious coffee will be served. The cost is $8.00 per person for Breakfast with Tomten and RESERVATIONS ARE REQUIRED. Please RSVP by December 5th. If you have any questions, please call 815-963-5559. This year, the Julmarknad will be held at Our Savior's Lutheran Church, located at 3300 Rural St, Rockford, IL. Enjoy a time to mingle and celebrate the season with glögg, saft, appetizers, and Christmas music! Held at the newly renovated Nordic Cultural Center, come and enjoy a festive night of food and friendship! Cost is $15 for Members and $20 for Non Members. Please RSVP by December 6th by purchasing tickets below. If you have questions, please contact us at to 815-963-5559 or email museum@swedishhistorical.org.